I swam around my bowl. I swam around my bowl. Twice. 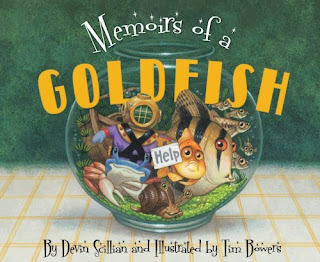 And so it goes in this tell-all tale from a goldfish. When assorted intruders including a hyperactive bubbler, a grime-eating snail, a pair of amorous guppies, and a really crabby crab invade his personal space and bowl, Goldfish is put out, to say the least. He wants none of it, preferring his former peace and quiet and solitude. But time away from his new companions gives him a chance to rethink the pros and cons of a solitary life. And discover what he’s been missing. Devin Scillian is an award-winning author and Emmy award-winning broadcast journalist. He has written more than 10 books with Sleeping Bear Press, including the bestselling A is for America: An American Alphabet and Brewster the Rooster. Devin lives in Michigan and anchors the news for WDIV-TV in Detroit. Early in his career Tim Bowers worked for Hallmark Cards, helping to launch the Shoebox Greetings card line. He has illustrated more than 25 children’s books, garnering such awards as the Chicago Public Library’s “Best of the Best” list. He also illustrated the widely popular First Dog. Tim lives in Granville, Ohio. Ok, so this isn't a memoir, but how cute is that? The title sounds like it was based on Memoirs of a Geisha...love it! I JUST saw this in our school Scholastic book order newsletter! SO must have it, now that I know what it is! I love it! I was browsing through Amazon for new memoirs when it popped up and I just thought the concept was adorable. Awfully cute idea! I love hearing about new kid's books.